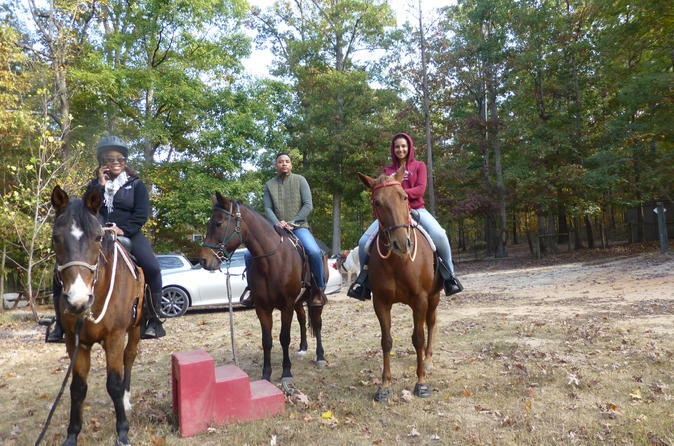 Our full-day Horseback riding Journey includes a 90-minute ride with at professional guide that will take you along our well maintained trails. from beginner to advance riders, we will navigate through beautiful, scenic wooded trails in Clayton or Athens Georgia. Then we travel to one of Georgia's beautiful wineries for some casual wine tastings and winery visit. Three days before your journey, we will email you information about the location. Depending upon availability, we will utilize our Clayton or Helen GA location. The trails in Helen wind through open fields, streams and wooded trails. In Clayton, our beautiful journey by horseback explores the quaint mountain community of Clayton Georgia. Following our ride, we will have a picnic lunch featuring turkey, flatbread, mustard, hummus, nuts, berries and seasonal greens from our organic farm. After lunch, we will drive to a nearby winery roughly 15 - 50 miles away for your wine tasting. Here you will taste Six different flavorful wines at the Boutier Winery, which offers a collection of wines developed from local produce and select vineyards. The winery is set on nearly 32 beautiful acres planted in Vinifera and French American grape varietals. Come and enjoy a wonderful day away from the hustle and bustle! Special Offer - Book and save $24 compared to the local supplier's prices! - Book Now!